Is there anything more relaxing than slowly easing into Sunday, after a morning of reading the weekend papers, while snuggling and nibbling on each other in bed? 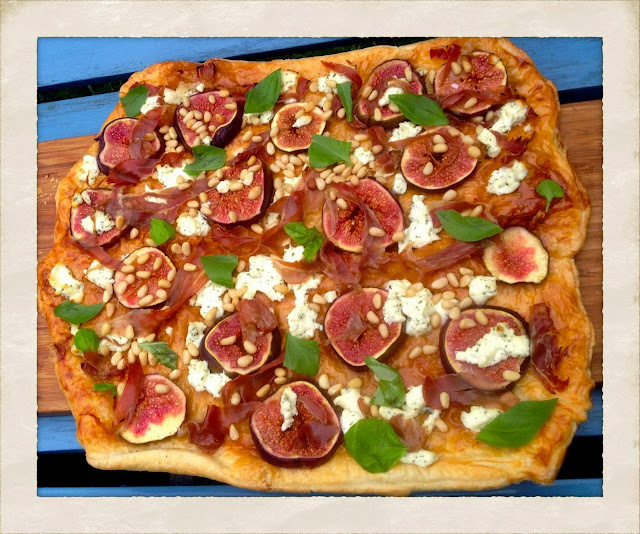 You can make this savory tart for six, but I especially like preparing it for two, with each of us getting a whole, greedy tart with which to feed the other, between sips of dark, Italian coffee, laced with warm, foamy milk. ** I usually use Sussex Slipcote, purchased from my local Farmer’s Market. It’s a soft organic, cheese made from ewe’s milk. Unroll pastry and gently transfer to baking sheet. No need to use parchment paper under it. As long as you don’t press on it too firmly, it won’t stick when baking. Gently shape pastry to suit your aesthetics. I go for an irregular rectangular shape. Break egg in small bowl. Scramble with a fork. Brush onto pastry. Bake pastry in hot oven approximately 15 minutes. Repeat the above process for second tart. 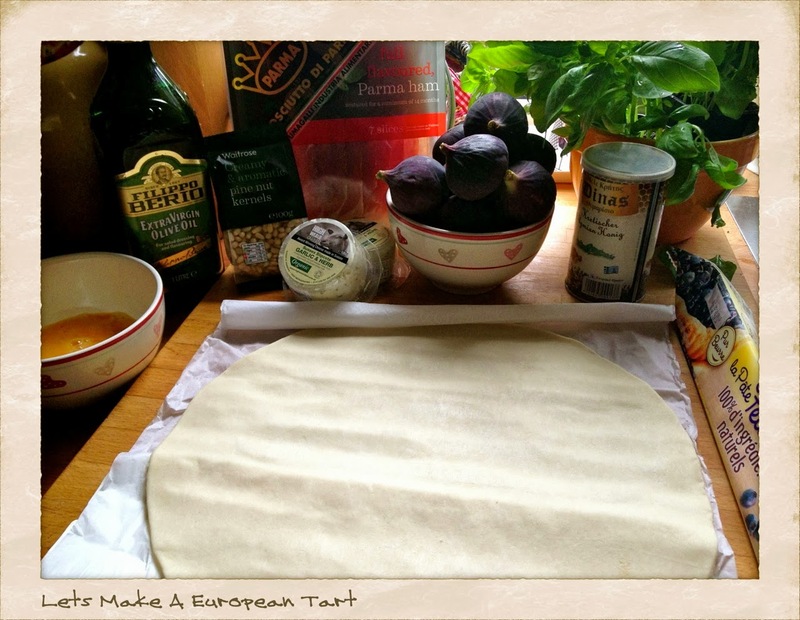 While pastry is baking, wash and slice figs into circles, removing any hard tips. 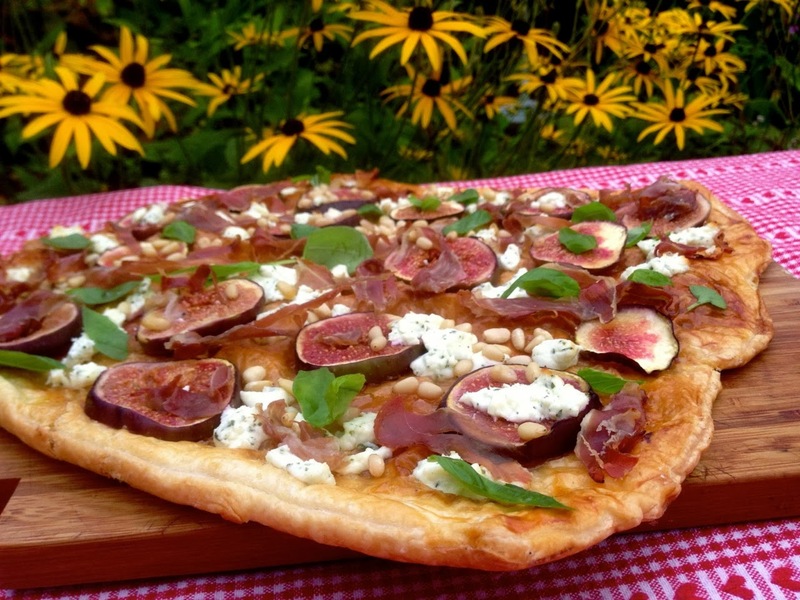 Each fig yields about five slices. Cut Parma Ham in smallish strips. Set aside. Wash basil, de-stem and tear into pieces. Set aside. When pastry is crispy golden brown, remove from oven. It will be very puffy, but will go down as you work your topping magic. 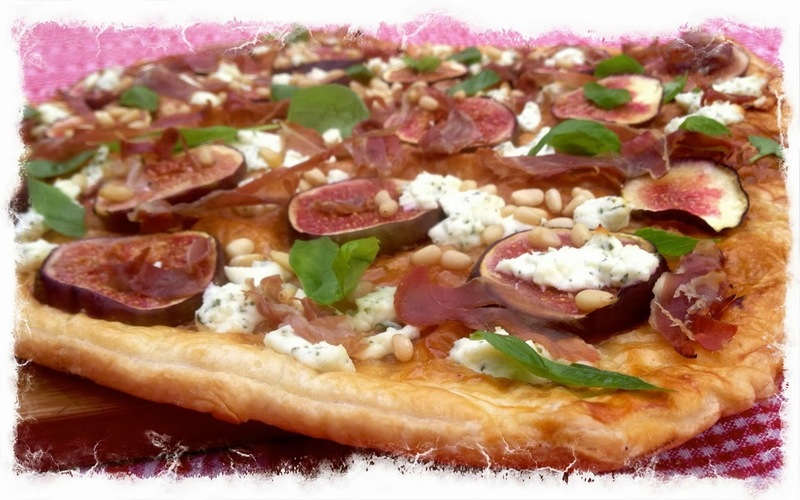 Adorn tart with slice fig, crumbled cheese, pine nuts, and ham. 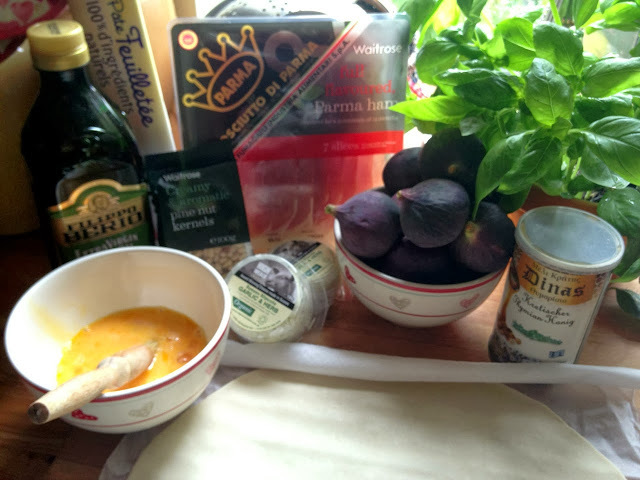 Bake in hot oven approximately eight minutes, or until cheese is melted and tart is very crispy. Remove from oven. Give a couple of good turns of the pepper grinder. Garnish with basil. Place on platter. Repeat with second tart. Take your sweetheart by the hand and gently guide your beloved to a cozy place, for an intimate brunch. Best beverages to accompany tarts are coffee; sparkling water; apple cider; pear cider; dry, crisp white wine; Prosecco; Italian beer; warm Sake. Later, a bit of quality White Chocolate, with a pot of Fennel, or Mint Tea, might inspire a couple rounds of Mexican Train Dominoes, Backgammon, or a fortuitous return to the boudoir.